The city is awash with construction and none more visible than the works for the City Rail Link. Most of the work so far has been to move services out of the way so that the tunnels can be built without breaking something – and there are a lot of services to move. 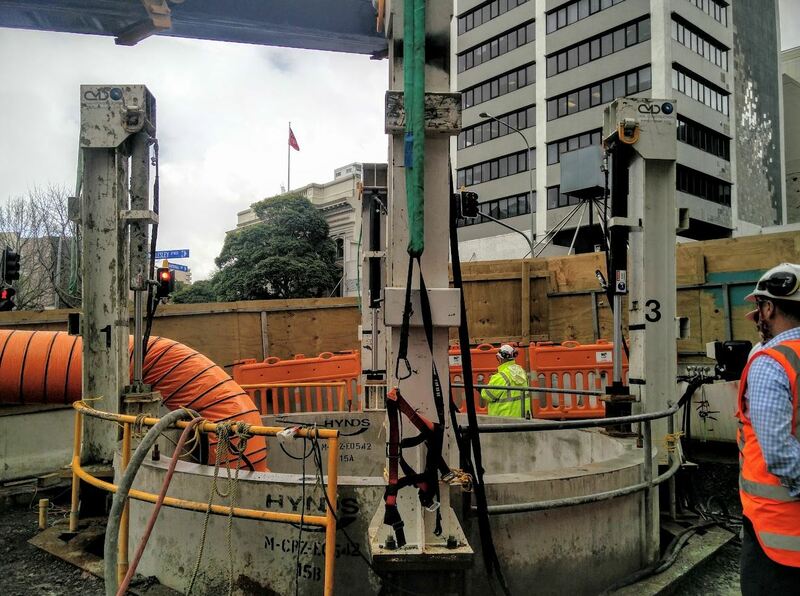 The biggest of these tasks is to divert a deep stormwater main along Albert St which involves using a micro-tunnel boring machine (MTBM). To divert it they first need to access it and the works for this have been going on behind hoardings on Victoria and Wellesley streets to dig shafts to launch and receive the MTBM. Last week Patrick and I were kindly given a tour of these sites to see the progress so far. The first stop was to the site on Victoria St on the Eastern side of Albert St. This is the most prominent site as there is a building over it covered in acoustic panels to help reduce noise for the site’s neighbours. This is also where the MTBM will be launched from. 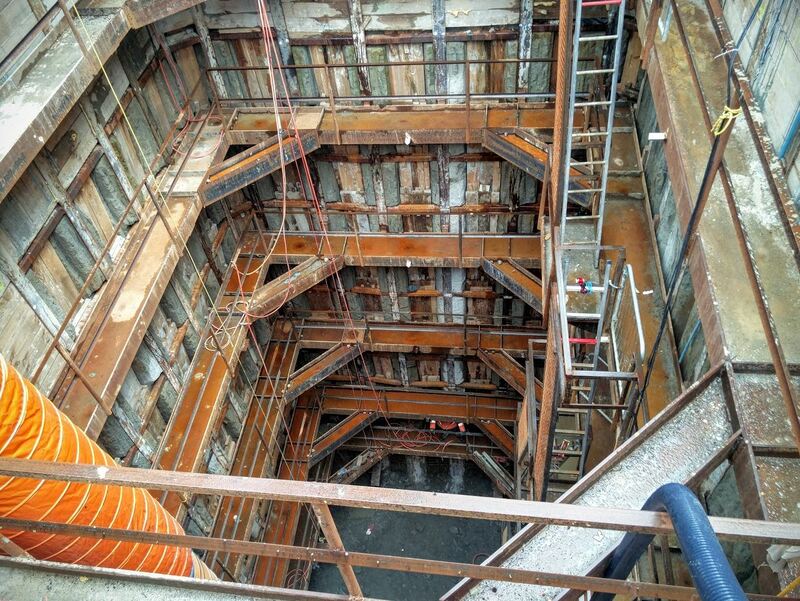 The shaft is around 18m deep and the stormwater pipe has been partially uncovered. Work is now going on to find the location of the brick lined Orakei sewer main which is a little bit deeper and expected to be roughly below the feet of the worker that can be seen at the bottom of the shaft. 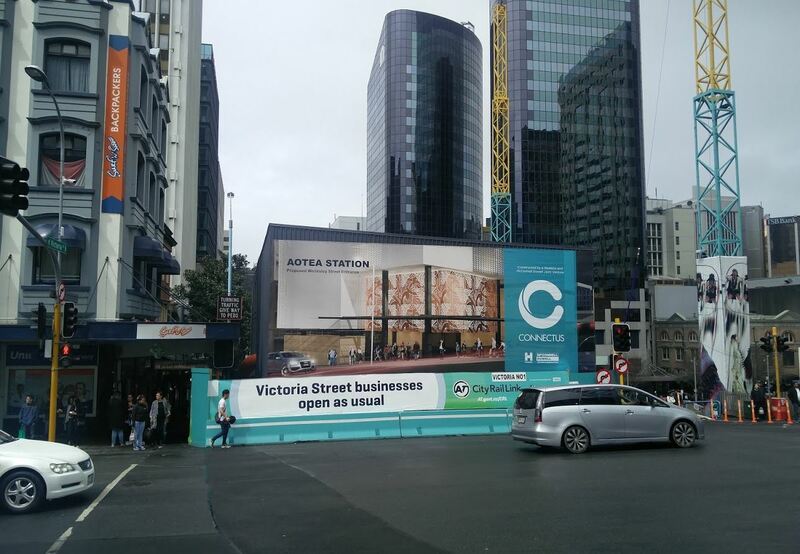 These mains run east-west under Victoria St and the base of the Aotea station will be at about the same depth as that stormwater main – hence why it needs to be moved. The new main to be built will connect directly into the stormwater main that can be seen above so before that happens a siphon will be built to temporarily divert it so the MTBM launched straight through the existing pipe. The spoil from the site is hoisted out via a gantry crane built into the acoustic building. Work on the site runs for 20 hours a day although trucks only remove material during the day to avoid the noise of trucks reversing. At night the spoil is stored on site. 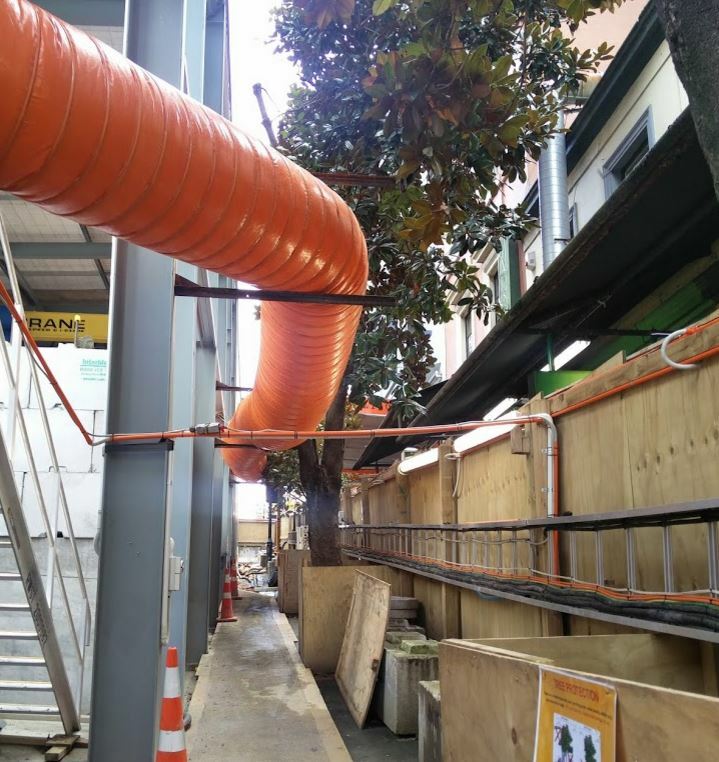 I also noticed they’ve taken a lot of care not to damage the trees on Victoria St.
One quite unusual aspect of this worksite is its location next to the reverse bungy site. A few times while we were there were suddenly loud screams as people were hurtled into the air. I can’t imagine hearing screams is something you’d normally want on a construction site, especially one which consists of a giant hole. On the western side of Albert St another, slightly smaller but a bit deeper shaft is also being built, but his one doesn’t have the acoustic panels. While we were there steel was being lowered into the shaft which is used to support the pile walls as they get deeper. Next we moved up to Wellesley St where the MTBM will be bored to. 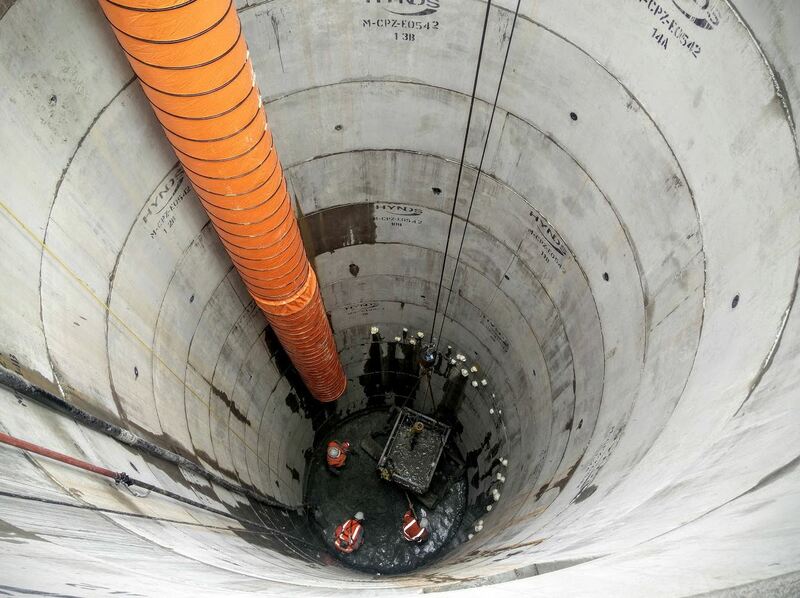 The shaft here is quite different in being much smaller and is effectively a concrete pipe being pushed into the ground via the weight of the concrete and some hydraulic jacks. It had been going fairly smoothly has been a bit tougher with about half a metre to go. At the bottom of the shaft you can see three workers digging out that last half metre or so by hand in what must be some real back breaking work. The hydraulic jacks that help to push the shaft deeper. 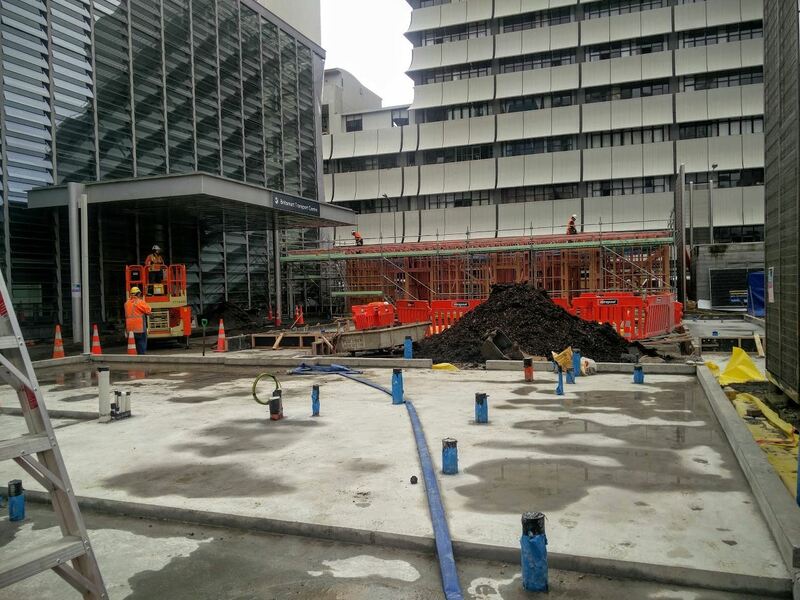 In addition to looking at the works around Albert St, we also took a look at works going on behind Britomart for the temporary entrance being built so the old Chief Post Office can be closed while tunnel works go on beneath it. This is more of a conventional building site, concrete foundations have been poured and framing is going up for the various facilities that need to be housed. Steel framing has also started to go up. Inside Britomart the gardens that were on the platform level have been removed (that large pile of dirt you can see) and we were told they were in the process of removing the tiles from curved walls next to the lifts (now behind the black curtain). Of interest they said the design has been modified to take into account the huge growth we’ve been seeing on rail services in the last few years. Finally, a few views from the office of the CRL team. This is the Commercial Bay site where piling work is already under way in some sections and the final parts of the old mall should be coming down shortly. This is of the Albert and Customs/Fanswhare St intersection. Despite being considerably narrowed down and northbound traffic on Albert St completely stopped, it doesn’t appear to have cause any major issues for traffic. 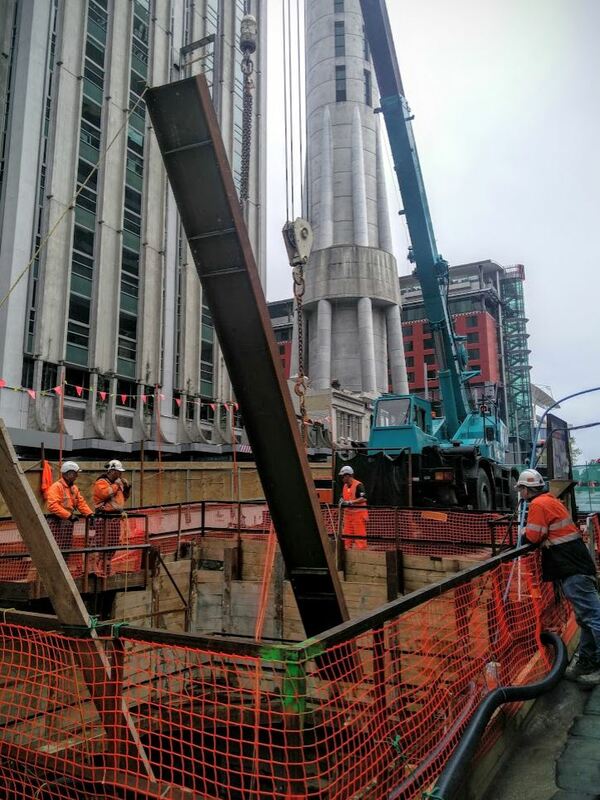 At the top of the shot you can see the huge Soilmec SR-100 piling rig that will be used for walls of the CRL tunnels up Albert St. The first piles should be started soon. All up it was a fascinating tour showing just how much work is being done to just to prepare for the CRL. Thanks to Auckland Transport and our tour guides Scott and Jenny. It’s an impressive feat alright!! Correction, it’s many impressive metres. 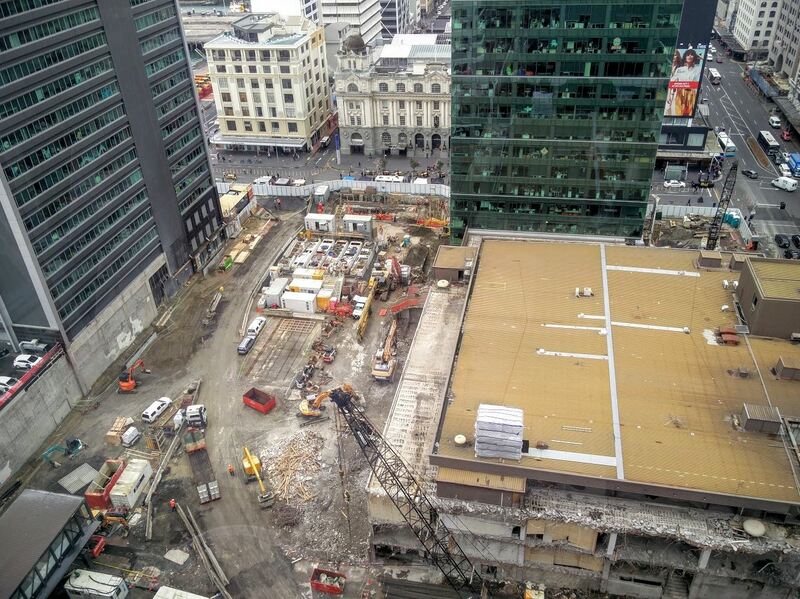 I’m not convinced by how interesting this is – that hole on Wellesley St already looks like it’s bored. I can’t fathom why you thought that joke was acceptable. It’s not even slightly in the league of what we try for here. I don’t think you’ll last here furlong. Yes, very impressive. Pity its taking seven or more years to complete. With the easy cut and cover section up to Aotea station could some services be started/terminated at Aotea sooner? Perhaps in 3 to 4 years? 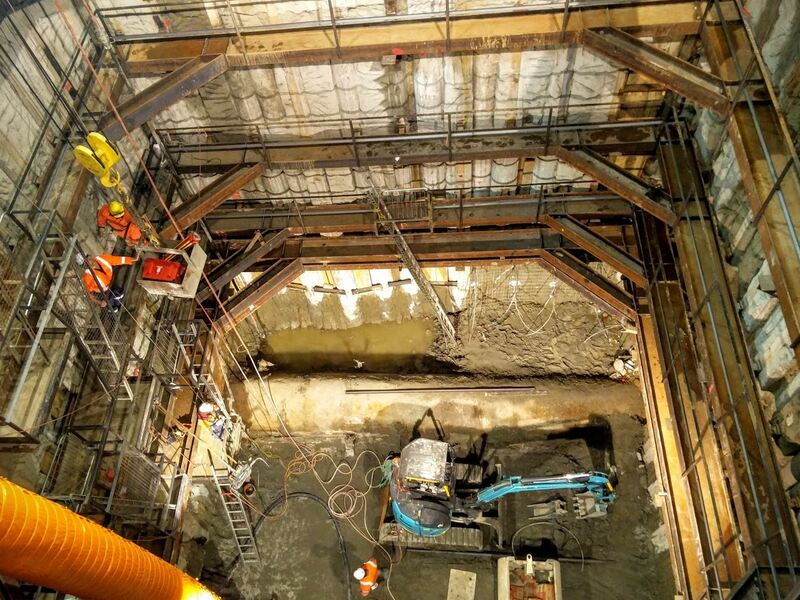 You need the “box” of aotea to extract the TBM, ( not a small creature), The pedestrian access to the rail levl can only be installed after the TBM has been removed (twice) through the vertical shaft…. Why do they need to extract the TBM? I thought these things were built for the project these days and most of the useful parts will only last long enough to dig the tunnel they are designed for? In the channel tunnel one of the TBM they just left in the ground after making it bore deeper under the tunnel so as to not be in the way. They left most TBMs in the chunnel. Trouble for us is that the turning radii are way to big for our little project. I just thought that with the cut/cover completed in 2019 that if the Aotea station was near completion by then that some trains could use it.. If the TBM extraction needs the whole station box then shut the station/remove furniture etc for the few days/weeks each extraction takes. I’m sure there would be a lot of happy commuters if for a year or four Aotea was a terminating station. Two tracks. The Shore line will not use the CRL but connect to it by transfer. Britomart was future proofed at the time of the build with a Northshore link on the harbour side and a future light rail link on the city side (no longer viable with the CRL) so I don’t see any real reason (other than everyone wants the Northshore link to go direct to Aotea) that Northshore rail can’t use Britomart and continue out the east side, effectively connecting to the current network (still by transfer for up town). Network capacity is why we don’t want to connect the Shore line into the CRL. It would severely limit frequency on all lines to do this. In the same way that all the various lines in Paris, or London, or where ever connect by transfer rather than all interline. +1 Patrick, adding a new lin needs to add capacity, not just stations. What’s really interesting is that there is no traffic disaster despite a reduction in roadspace that every traffic engineer would go to grave claiming would bring the city to its knees. Once again we have evidence of the essential malleability of traffic ‘demand’. Traffic is not a liquid but a gas, it expands and contracts to occupy the space available to it. And this is particularly easy in dense urban centres where there are real alternatives. Especially as these are being continuously improved. There is no need to ever return Victoria St to its previous width, the linear park should follow the works directly, Albert St can clearly be rebuilt with full time bus lanes. Thanks for full scale trial CRL. Indeed, and small versions of this happen all the time but are routinely ignored by AT. 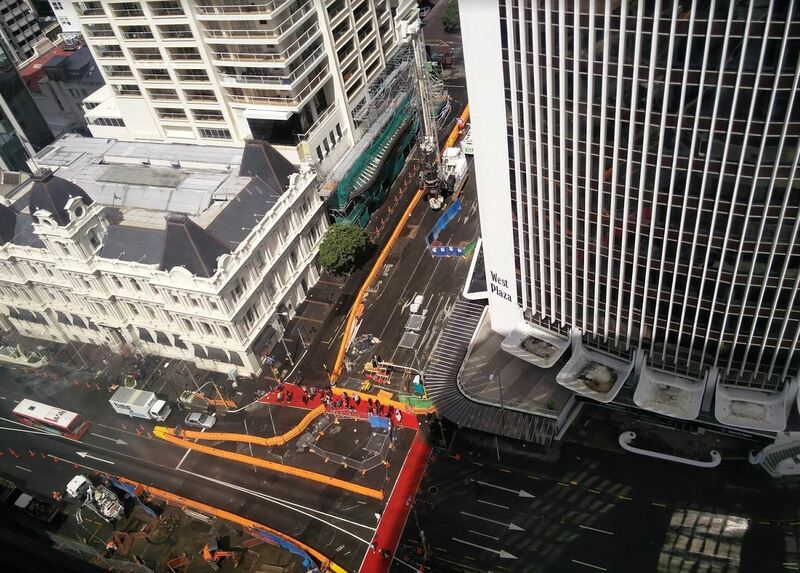 The complete closure of Halsey St (returned to its 6 lane glory shortly afterwards) comes to mind, and currently Courthouse Lane and Freyberg Square are closed and working fine, yet AT are determined to once again reopen both of these to vehicles. 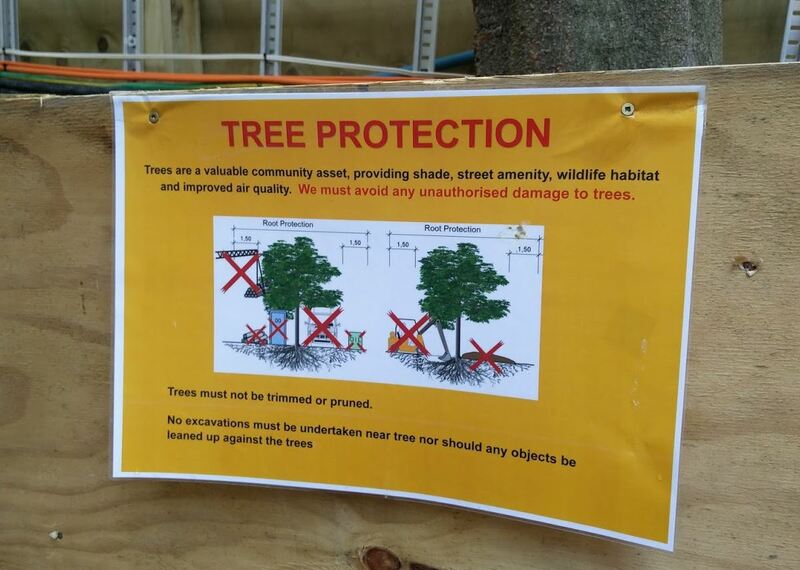 To be fair, Courthouse Lane and Freyberg Square were decisions by the council, not AT. Halsey St intersection; what an appalling piece of work, especially for pedestrians and anyone on a bike. At least they will get to stare down on its glory from their new offices. And yes it is hard to see how anything is improved with its reopening, certainly not the traffic FLOW on Fanshawe [FLOW must always be in uppercase, cos religion]. The Freyberg Square ‘retailer ramp’, the little suburban driveway hysterically fought for by various local frock sellers, that precisely separates the community building from the community square, would be funny were it not so sad. Agree the sooner Victoria St becomes a linear park the better. It would be a great pathway to Aotea Station. We had a lot of spare road capacity in the CBD. I had to drive there during the afternoon rush hour a while ago, and apart from a queue to enter the motorway on Hobson Street I didn’t encounter any congestion at all. You can say something similar about Nelson Street. It has two lanes less, and the left turns now have a lot less green time due to the cycleway. It has definitely more congestion now, but considering it is a street in the middle of the city it’s still flowing pretty well. One thing which doesn’t work anymore (during morning rush) is driving along Mayoral Drive / Albert Street, which is more or less blocked at Wellesley Street now. The traffic lights give most priority to Wellesley Street. No surprises there given the construction works over there, but I wonder if there’s a better solution for traffic turning left towards Hobson Street, and perhaps more importantly, the buses getting stuck in that queue. It depends on how you define the issue. Some say there is a housing crisis (“people are living in cars!”) yet the government says there is not. You say there is minimal disruption as a result of reducing Victoria St to a single lane and others (anyone who has to actually drive through it at peak hours perhaps) would say the opposite. But it’s pointless arguing because it’s fait accompli. Auckland drivers can look forward to long lines up and down these single lanes because at the front of the lane some drivers will be turning left or right but must wait for jay walking pedestrians or oncoming traffic going straight through. And because the drive times are now longer the bus times will seem shorter. Oh wait, buses will also be stuck in that single lane of traffic too. But joy of joys, we will have a ‘vertical park’ a.k.a. a green strip* that ‘connects’ with Albert Park. Honestly, I’d be happier if they slotted in a cycle lane on each side of the soon to be narrowed Victoria Street instead of just widening the pavement to the extreme and calling it a park because at least that would make more sense – because it would be more useable. Of course experience of traffic congestion is subjective, and frankly anyone who has travelled to overseas cities knows Auckland has hardly any at all in compared to say Moscow, or Manila, or KL, or almost any city of scale. But we have a cultural memory of even fewer vehicles and a cultural expectation of driving at all times right at or above the speed limit everywhere, which is entirely absurd. It will take a bit of time for expectations to shift, a process which is already underway. Yet the really important thing is that ‘demand’ as it is called, is actually highly elastic, people are rational and will shift to other modes where they are better, especially in particular locations like downtowns, and in terms of the Centre City we are in a very different age from late last century when it was feared that the area would die commercially unless everyone was able to drive and park easily to access it. Now, as is the case all over the world, the economic viability of downtowns in thriving cities like Auckland is pretty much in inverse relation to how welcoming it is for vehicle users. It is time for a more conscious recognition of this condition for urban centres by AC and AT, with policies to take advantage of it. Particularly the City Centre, but not only. I’m in London at the moment so getting a first hand look at real congestion. Auckland’s problem is that our CBD is in a canyon ie between two ridges so not conducive to walking or cycling (enthusiasts of both will disagree, I know). One thing I have seen in other cities (overseas) are having carparks on the edge of the city centre and then free shuttle buses to ferry you in (or just no bus if it’s a small town) and out. I’d be quite happy with ditching all street parking in the central CBD and replacing it with a free bus loop. Cars can pay to use a car park. While we wait for a tram line up and down Queen Street (projected for 2040?) why not close Queen St to all vehicles (cross traffic through Customs, Wellesley, Victoria, Mayoral Drive, etc excepted) and run buses up and down instead. One going up Queen Street, turning left at K Rd, and then looping back via Symonds St/Anzac Ave. You could have another one going in the reverse direction ie down Queen St, and looping up Hobson St via Customs St. From Hobson St you’d curl back to Queen St via Pitt St and K’Rd. All these roads could handle a dedicated bus lane (and a cycle lane in most places too probably) given you’re removing a lane of street parks. With traffic lights tweaked in favour of approaching buses it should work a treat? The Viaduct/Wynyard Quarter could have it’s own circular loop, possibly intersecting near Customs St to create a complete PT option for people in the CBD. Nick all that needs to be done is to improve the effectiveness of current city access bus routes by getting them more street priority. The City Link, Inner Link, and all other buses, can serve this purpose, along with ferries and ultimately new CRL stations and services and busway(s) serving longer riders. Now that Fare Itegration means the bus ride to stations is effectively free, and the New Network starts this month, city access by PT from almost everywhere is not only better but on a constant uplift for the next seven years. My point is that we need to also take the benefit from this in the form of returning city streets to pedestrians, bike riders, and delivery, by reducing the amount space and time prioritised to private vehicles. And the same in Metro Centres. “between two ridges so not conducive to walking or cycling (enthusiasts of both will disagree, I know)” – By enthusiast I assume you mean anyone who actually knows anything about walking and cycling beyond what someone came up with at the pub with their mates. Cycling can grow anywhere as long as separated facilities that feel safe are provided. London is a great example of that having just been riding around London on a Boris bike the last few days. When I lived in London in the late 90s nobody would have contemplated cycling. But build some separated lanes on arterials and suddenly every man and his dog is out there on a bike. A lesson repeated all over the world (including Auckland) but still disputed by those who cant see beyond their bonnet. I wouldn’t fancy working below suspended loads in the round concrete lined shaft. How much asbestos is coming out of the downtown centre? Think what it must have been like building those storm water and sewer mains in the first place. It is interesting to see the construction sites from above. For many of us the only view is from street level. Whilst walking in Lower Albert St I have thought what a wasted opportunity the closing off of the downtown mall pedestrian walkway has been. This could make an excellent vantage point for those to look out at the construction site we are all funding. It would also provide public space where so much has been removed. Come on AC and AT, get ambitious for our city.